At first glance, the HP ZR30w may look like the previous30-inch diagonal Performance Series monitor, but its new and improved features make this model a Generation ‘wow’ monitor. For starters, it has a new aluminum-clad chassis that uses a minimum of 25% post-consumer recycled resin for more responsible resource utilization. Next, it houses a lower power panel, making it more efficient than previous 30-inch models. And finally, it comes with an 85% efficient power supply. Once you take a closer look at the HP ZR30w, you’ll find that HP has gone to extreme measures to make their biggest monitor better. It’s difficult to review the $1,660 HP ZR30w fairly, without also mentioning the $1,500 Dell UltraSharp U3011. I won’t speak in specifics concerning the Dell’s performance (we’ve tested but not yet reviewed it), but I will say that it offers many more connections and features than the HP ZR30w, at a lower price. 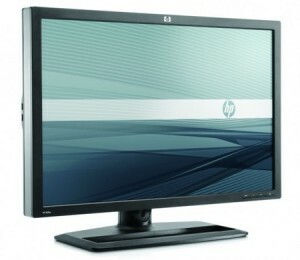 The monitors use the same LG panel, but unlike Dell with the U3011, Hewlett-Packard decided not to include an onscreen display (OSD) with the ZR30w, severely limiting its performance potential, as the only adjustable option is brightness. Although the ZR30w has great baseline performance, it’s difficult to recommend it when there are other, much more well-equipped 30-inch monitors on the market for a lower price. The LCD market continues to be one of the frequently updated segments in the consumer electronics segment, as OEMs and vendors alike are eager to bundle their high-end, high performance displays with professional workstations. The ZR30w belongs to that same pro market, offering a 10-bit panel with 1.07 billion colors – for an advertised 99 percent coverage of the AdobeRGB 1998 gamut and 30-bit per pixel color. HP claims that the ZR30w is the first 30″ display to break 1 billion colors. When you’re selling a 30” LCD to enthusiasts, every bit of performance matters, and as we’ll show in a bit, the ZR30w doesn’t fail to impress. HP’s new flagship monitor is a sight to behold, and beneath its sleek good-looks lies the kind of performance to make any PC owner go weak at the knees. Its 10-bit IPS panel is capable of displaying a staggering 1.07 billion colours – if you have a 10-bit workstation-class graphics card, that is – and is partnered with a 2,560 x 1,600 resolution. HP also claims the monitor covers 99% of the Adobe RGB colour space.